Published by Cyril Huze September 13th, 2015	in Controls, Customs and Editorial. 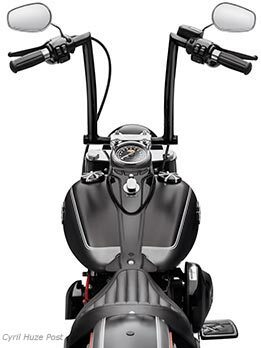 Bolt on classic chopper attitude with the new Fat Chizeled Handlebar (P/N 55800421 Chrome, P/N 55800422 Gloss Black; $379.95) from Harley-Davidson® Genuine Motor Parts & Accessories. The Fat Chizeled Handlebar features the edgy profile of the classic “Z” bar and combines the hands-up feel of a mini-ape with the narrow width of a drag bar. 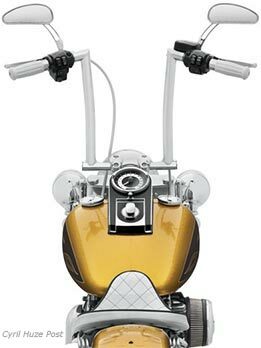 When installed with the stock riser, this 12-inch-tall handlebar has the look and feel of a 14-inch bar. Instead of typical mitered-and-welded corners, the Fat Chizeled Handlebar features cast, seamless 90-degree elbows that eliminate sharp internal bends. The bar features removable Bar & Shield plugs to simplify internal wiring. 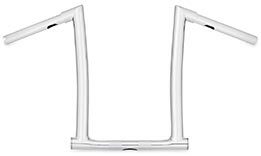 The 1.25-inch bar necks down to fit stock 1.0-inch handlebar clamps. The tip-to-tip width is 27.5 inches; base width is 9.5 inches; and pullback is 4.0 inches. The Fat Chizeled Handlebar fits 2012-later Dyna® Switchback™, 2013-later Street Bob®, and many 2000-later Softail® models, but does not fit with heated hand grips. All models require separate purchase of additional installation components. See an authorized Harley-Davidson dealer for complete fitment details. For more information, visit Harley-Davidson. Sweet. Unsafe and cool all at the same time! Love apes. Much more comfortable than what most think. The company list all of these non essential items Fools Gold. Owner proven ! $379.95 for some bars? Made in? HD does it like no other bike maker. Funny how the MoCo is copying the kool kids more and more. Next thing you know they will be selling factory rigid’s again. Pretty good for people with narrow shoulders. Not so much for big people. Yeah. I’m often blown away by what they charge for some bar steel with chrome or powder coating these days. That’s a heckuva mark up for $25 in materials and 1 hour of labor (being generous). Let’s just say $75 for time and materials for the sake of argument (if made in the USA). They look like nice bars to me, if the corners are cast then wiring should be much easier than most others. A bit on the expensive side but we all know that HD knows how to charge. Hey only took 8 or 9 years to catch up this time!! Ok skool biker mentioned this to me the other day. Sit in your car or truck with hands at 10 n 2 o’clock. Take note of the position of your arms and shoulders… Go get apes that fit that position. It works!!! Fat Boy good advice ! Internal wiring these should be a lot easier than most welded 90 degree bend bars like the M F ers. Some of those bars can be a nightmare. With the cast lower with smooth inside corner and plugs on each side to push/guide the wiring, it should be much simpler. But yeah, H-D is a little late and very pricey. And why won’t these fit a dyna?